If you are just starting out with the process of finding your ideal cruising boat, whether power or sail, the variables and choices can seem a bit intimidating. And it doesn't help when marketing efforts dull one's common sense about what are good choices for the role this boat will play. (I'm working on an eBook about selecting the right cruising boat, so stay tuned.) Many people overthink the process and focus too narrowly, or create a wishlist that is impossible to satisfy, or pick up misinformation that leads them in the wrong direction. I can share countless examples where people with enough budget but not enough experience simply let themselves be talked into a boat way bigger and more complicated than they really need. Happens all the time. So I asked what his immediate plans would be for the next couple of years after his retirement the following year. He said they were hoping to leave the Midwest and do the Great Loop before perhaps spending a season in the Bahamas. They had not thought much more beyond that. I told him that he had many more choices than he realised. Boats that would easily fit the needs (and budget) of a couple doing the Loop and/or the Bahamas. Boats they could afford right now. I told him not to worry about an ocean-crossing trawler for voyages that are over the horizon. Focus on a boat that fits your needs as they are now. As we continued to talk, I offered numerous trawlers, tugs, and faster cruisers worth checking out. I swear he got taller by an inch or two, a weight lifting off his shoulders. He started to see that the obstacles he'd placed in front of their dream were totally unnecessary and actually in the way of finding the Good Ship Happy that would make their dream come true. By the time his wife returned, he was smiling, and happy about the prospects of walking out of the Marriott lobby and going into the boat show with fresh eyes to find their "now" cruising boat. In his head, he had closed the cover of Voyaging Under Power, and put it back on the shelf. Another time I had a conversation with a lovely couple who also were thinking of their retirement plans. In their case, their list was down to three boats: Nordhavn 57, Kadey Krogen 58, and Cape Horn 65. I don't recall all of the details, except that shortly after that event, PMM publisher, Laurene got a super nasty phone call from Peter Sever, president of Cape Horn Yachts, who was livid I had essentially told them not to buy a Cape Horn. He threatened to pull advertising and sue us. I got on the phone with Sever and asked if he had ever asked the couple where they planned to go. He had not, and began losing his steam when I explained that as new boaters, they wanted to start with inland and coastal cruising to gain experience, and the height and draft limitations of all three boats made them poor choices. The enormous fuel, water, accommodations, and displacement of these dreadnaughts were totally unnecessary for what this couple planned to do for their first cruising venture. Cape Horn 65, hardly the right choice for new boaters to learn cruising in inland and coastal waters. Just imagine the headaches! I have no idea how the couples' stories played out, but I would not be surprised to hear the first couple did the Great Loop in a boat like the Monk 36 and had the experience of a lifetime, while gaining the confidence and skill to aim for more ambitious adventure. 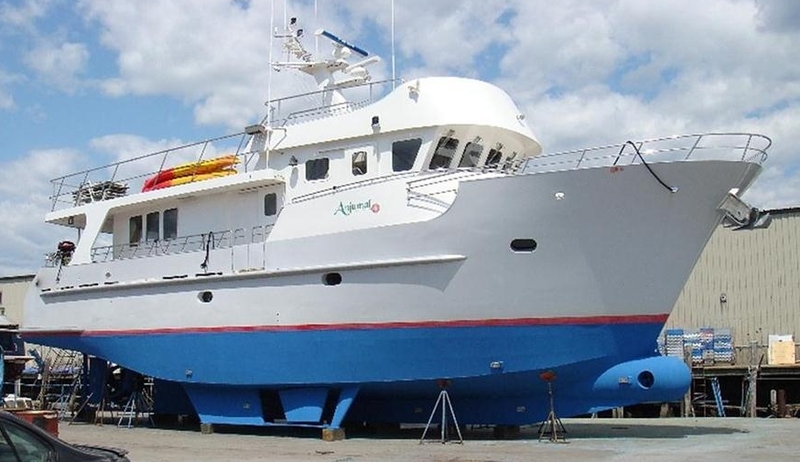 There are so many trawlers and other boats that are comfortable, reliable, economical, and perfect for doing the Great Loop and exploring the Bahamas. Many have told me that a boat like this Monk 36 is ideal for two people to winter in the Bahamas. The key is to find the smallest boat that is big enough. By the way, James and Jennifer Hamilton gained their initial cruising experience on a Bayliner 4087 before they eventually sold her to buy a new Nordhavn 52. They just crossed the North Atlantic Ocean as I wrote this.